The Broadcast Film Critics Association (BFCA) held their ceremony tonight for the 18th annual Critics’ Choice Movie Awards at the Barker Hangar in Santa Monica, California. Ben Affleck's Argo captured the top prizes, claiming Best Picture and Best Director. 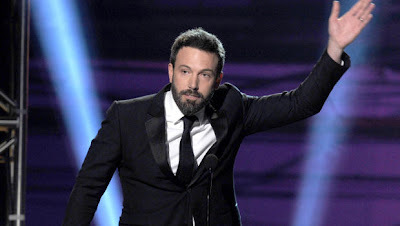 It was an especially pleasing win for Affleck since he was not included among the nominees announced this morning for the Oscars. In his acceptance speech, he said "I'd like to thank the academy..."
Silver Linings Playbook captured the most awards. It won four prizes – Best Acting Ensemble, Best Comedy, Best Actor in a Comedy (Bradley Cooper), and Best Actress in a Comedy (Jennifer Lawrence). In addition to her awards for Ensemble and Actress in a Comedy, Jennifer Lawrence also won for Best Actress in an Action Movie. Other multiple award-winners included Lincoln (Best Actor for Daniel Day-Lewis, Best Adapted Screenplay, Best Original Score), Skyfall (Best Action Movie, Best Actor in an Action Movie for Daniel Craig, Best Song), Zero Dark Thirty (Best Actress for Jessica Chastain, Best Editing), Life of Pi (Cinematography, Visual Effects), and Anna Karenina (Arti Direction, Costume Design).